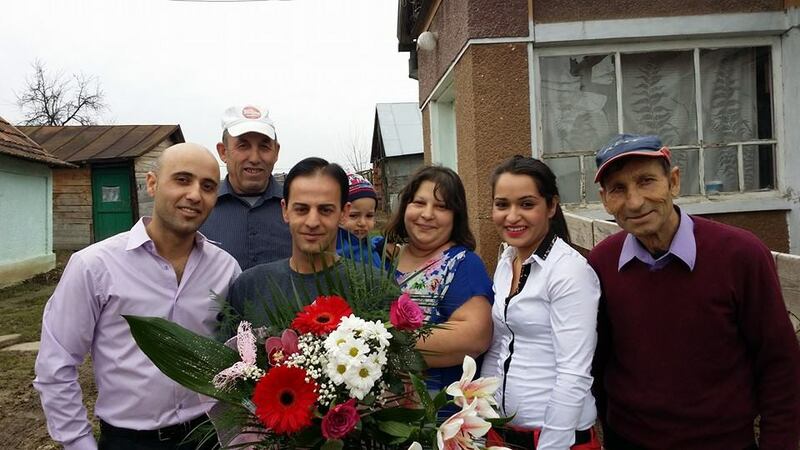 BUCHAREST, ROMANIA 3/7/15: Izidor Ruckel, America’s most well-known Romanian adoptee, arrived in Romania March 1. On his first trip back to his home country in a decade, Izidor is spending the first two weeks of a two-month visit touring the country with ProTV. ProTV’s Irina Fodor is traveling with Ruckel as he re-traces his former life in Romania, including visiting his orphanage in Sighetu Marmației, a small northern town on the Romanian-Ukrainian border, and meeting up with his birth family. Ruckel brought Fodor a copy of his autobiography Abandoned for Life for her review. He hopes to communicate his love for his home country, especially for the children who still struggle as unwanted orphans, as he once did. Ruckel will be a guest on La Măruță, ProTV’s primetime entertainment news magazine, on Monday and Tuesday, March 9-10, airing at 5:30 p.m. Romanian time. Ruckel encourages viewers to tune in for footage of his visit to the orphanage he lived at for the first 11 years of his life, as well as his first time meeting relatives from his extended biological family. In addition, Ruckel has a big surprise for planned for the live show. Tune in Monday to see his announcement! 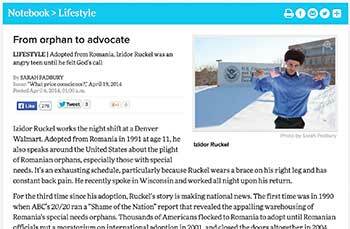 DENVER, CO, 1/15/15: Izidor Ruckel, America’s most well-known Romanian adoptee, is traveling to Romania in March to meet with government officials and child welfare workers to discuss ways to improve living conditions for the country’s orphans, including those living in institutions and in the streets. Izidor lived the first 11 years of his life in an appalling Romanian institution, giving him personal motivation to reach out and help those who live as he once did. In 1991, an American family adopted 11-year-old Ruckel from an orphanage in Sighetu Marmatiei, a remote city in northern Romania. He returned to Romania in 2001, accompanied by ABC News 20/20, and visited his old orphanage, reuniting with several old friends. Upon returning back to the United States, Ruckel felt compelled to advocate for institutionalized children everywhere. Ruckel completed his autobiography Abandoned for Life in 2003, and has spent the last decade speaking around the country to raise awareness and funds for those left behind. In 2013, Ruckel teamed up with filmmaker Alex King, another Romanian adoptee, to produce a two-time award winning documentary about Romanian adoption called Given Our Chance. Ruckel’s return to Romania this spring signals a new hope in his heart: to see how he can personally help local communities and government officials motivate the public to help its lost children. He plans to travel around the country for several weeks, talking to anyone who will listen. On Mar. 21, Ruckel and Alex Kush, an former orphan adopted by a German family, will give a presentation in Brasov, which they hope will encourage Romanians to step up and help the orphans in their midst. They also hope to inspire the area’s struggling orphans to not give up. Like Ruckel, Kush has advocated for orphans across the globe, including speaking before the Romanian Parliament in 2013 where he advocated for the re-opening of international adoption. 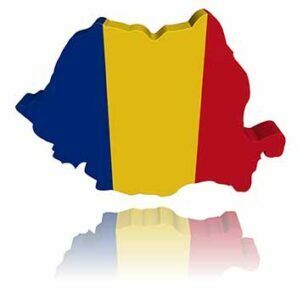 Romania has remained closed to international adoption since 2003. Ruckel also hopes to provide a dinner party, bringing together his former orphanage friends and some of the nannies who showed them kindness. To learn more about the campaign, and to consider donating, visit this fundraiser page. 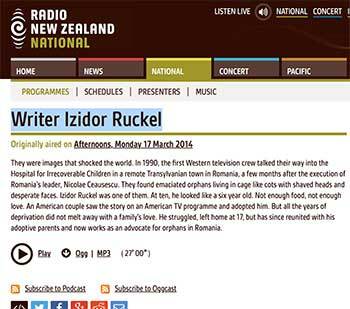 Radio New Zealand interviewed Izidor Ruckel on Mar. 17, 2014.